For the high quality commercial window tint in Oxnard, turn to a LLumar window tinting dealer. Help reduce your company's energy expenses, work in cool comfort, and upgrade your facility's interior and exterior with commercial window tinting. Since 1961, LLumar's commercial window tints in Oxnard have helped protect companies combat the sun's tough heat and destructive rays. To this day, we continue to help businesses improve their facilities, wherever they may be! Your commercial window tinting company in Oxnard has been handpicked to provide you, and your employees, with a great experience. Call your LLumar dealer in Oxnard for a fast commercial window tint estimate! You can help limit the strain on your facility's energy bill, provide increased comfort for your staff, and convey a polished, stylish look with commercial window tinting in Oxnard. Ranging from crystal clear to deep charcoal, there’s a tint shade to match the needs of your business. Your LLumar specialist can install a non-reflective window tint for your business, which offers a consistent look that melds flawlessly with the existing style of your building. Dual-reflective options are also available for companies that need a glossy exterior to improve solar heat rejection, but a less reflective interior for additional privacy in the evening. 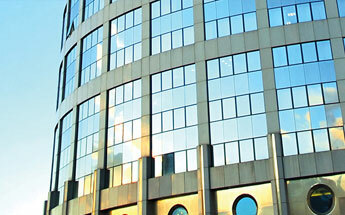 Window tinting in commercial spaces can be installed beyond the exterior of the building. Inside your facility, it can be installed as an additional design feature that offers style and privacy in stairwells, conference rooms, and on interior office windows. Call or visit your LLumar window tinting company in Oxnard to get started on your commercial tinting project.